Ziad Abu Ein's death death sparked Palestinian Authority outrage, but the PA 'minister' has a rather darker history than some might imagine. Ziad Abu Ein in previous clash. 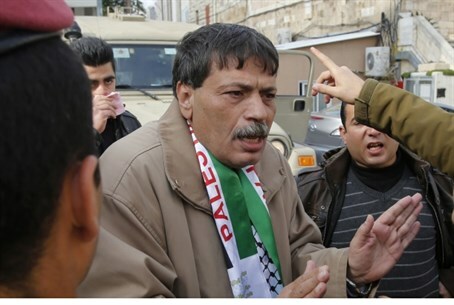 Ziad Abu Ein (55), a senior Palestinian Authority (PA) official, died in Ramallah on Wednesday after suffering a heart attack during a 300-strong "protest march" in Samaria according to IDF appraisals; reportedly he had high blood-pressure and diabetes. Arab sources claim that Abu Ein died after being shoved by Israeli soldiers during a march to plant olives in an apparent land-grab attempt to create facts on the ground. PA Chairman Mahmoud Abbas lost no time, already calling for three days of general mourning and condemning "the brutal assault that led to (his) martyrdom," vowing "we will take the necessary measures after the results of the investigation into the incident." Likewise, the PA has reportedly cut security cooperation with Israel as a result of Abu Ein's death. But just who was Ziad Abu Ein? According to the Palestinian Arab Ma'an News Agency and AFP, Abu Ein served as the head of the PA Committee against the Separation Wall and Settlements. Significantly, both sources added that Abu Ein was a member of Abbas's Fatah movement's Revolutionary Council, which is also known as the Abu Nidal Organization - a recognized terrorist organization in the US for over 20 years. After a string of bloody terror attacks conducted worldwide in the mid 1980s, the Revolutionary Council was labeled as the world's most dangerous terrorist organization according to the Council on Foreign Relations website. It remains on the US State Department's official list of foreign terrorist organizations, although it is thought to be largely inactive at present. And Abu Ein's terrorist past is not just a matter of guilt by association. Abu Ein himself was handed a life sentence in Israel in 1982 after being extradited from the US in 1981 over the murder of two Israelis in Tiberias in 1979. Abu Ein planted the explosives which killed the two - Boaz Lahav and David Lankri. Even in the decades after his release, Abu Ein continued to advocate for Palestinian violence. In a 2006 interview with Al Alam TV, he said he supported the Oslo Accords - because they enabled Palestinian freer access to weapons to use in terrorist attacks. "The Oslo Accords are not the dream of the Palestinian people. However, there would never have been [violent] resistance in Palestine without Oslo," he said. "Oslo is the effective and potent greenhouse which embraced the Palestinian resistance. Without Oslo, there would never have been [violent] resistance." "In all the occupied territories, we could not move a single pistol from place to place. Without Oslo, and being armed through Oslo, and without the Palestinian Authority's "A" areas, without the training, the camps, the protection afforded by Oslo, and without the freeing of thousands of Palestinian prisoners through Oslo - we and this Palestinian resistance would not have been able to create this great Palestinian Intifada." Commenting on Abu Ein's terrorist past, Lt. Col. (ret.) Meir Indor, Director of the Almagor terror victims organization, responded to the PA official's death by saying "Almagor isn't sorry and I welcome his death." "He murdered two youths in Tiberias and fled to the United States, was extradited to Israel...and released. Since then he's been busy with activities against Israel and was advanced to deputy minister of prisoners, and from there to an additional post as minister of the struggle against settlements. His death leaves Israel with one less enemy," said Indor. As hinted to by Indor, before switching to his post on the PA Committee against "settlements," Abu Ein previously held the post of PA Deputy Minister of Prisoners' Affairs, leading a ministry tasked with providing funds to Arab terrorists jailed in Israel to reward them for their crimes. Back in June he announced that the ministry was being transferred to Palestine Liberation Organization (PLO) control, hinting it was being done to dupe foreign donors and avoid attention over the fact that the PA was bankrolling jailed terrorists in comments translated by Palestinian Media Watch (PMW). "We eliminate the international pressure and the attempts to tamper with this issue," Abu Ein declared. "The (PA) leadership wants to keep this holy issue away from the influence of the donor countries, the interference of the donor countries, and the occasional negative influence of the donor countries." In another statement by Abu Ein back in 2011, also translated by PMW, he claimed conditions in Israeli prisons were "worse than the Auschwitzes of the Nazis." That statement stands in stark contrast to televised comments by released Arab terrorists who spoke of a life of ease in Israeli jails.